SAN DIEGO - Police are investigating an online threat of violence to San Diego's LGBT community that read: "You're next." On Tuesday evening, a 10News viewer saw the post in the men-seeking-men section of the Craigslist San Diego personal ads. He took a screenshot and sent it to 10News before the post was flagged and removed. The post is titled "We need more Orlando's (sic)," and it is accompanied by a photo of a hand firing a revolver with a bullet coming out of the barrel. The post read: "Orlando was long overdue. Cleanse your community of the filth that gives decent gay men and women a bad name. Those people were walking diseases, bug chasers, and thank god for AIDS and 9-11 and now Orlando. 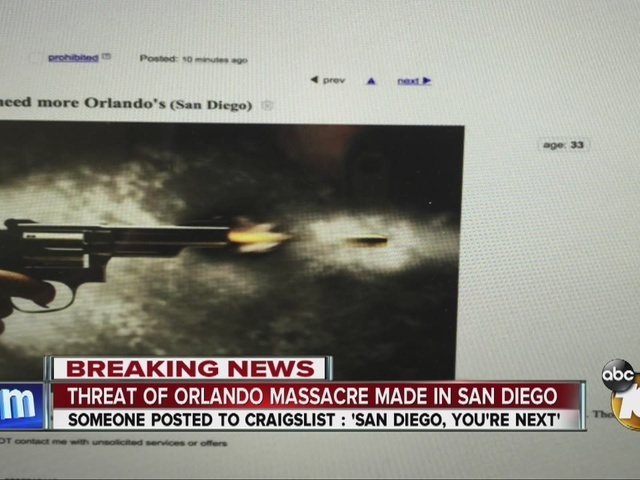 San Diego you are next …"
10News sent the screenshot to the San Diego Police Department and the FBI. SDPD Lt. Scott Wahl said the department will investigate the post. Wahl emphasized that police have had extra officers on patrol in places where people gather in the wake of the Orlando shooting. FBI Special Agent Darrell Foxworth told 10News the bureau's Joint Terrorism Task Force is investigating the posting. Foxworth told Team 10 the task force is a multi-law enforcement agency that will work together to find out who made this threat. "This is something that's very serious, very concerning to all of us, especially given what's happened recently in Orlando," said Foxworth. Foxworth said the FBI receives thousands of similar complaints from across the country. "We are going to use all lawful means available to us, so if we have to go out and get a search warrant, we will do that. If it doesn't require a search warrant, we're going to do whatever it takes to do it in a lawful and legal matter," Foxworth told 10News. Foxworth said there are no known credible threats to San Diego right now, but they are always keeping watch. "We don't have the luxury of just looking at this and letting it go," Foxworth said. "The San Diego Police Department is aware of a recent post on Craigslist that has since been removed. We are investigating it collaboratively with our law enforcement partners. The latest information remains, there are no known credible threats to the San Diego region. As always, we encourage our community if they see something, hear something, or know something, to say something."